Thomas R. Schiff’s vivid panoramic photographs capture the iconic buildings and landscapes of San Francisco and the Bay Area in new and surprising ways. From the Golden Gate Bridge to Coit Tower, they offer a refreshing perspective on familiar places and reveal unexpected treasures in everyday ones. 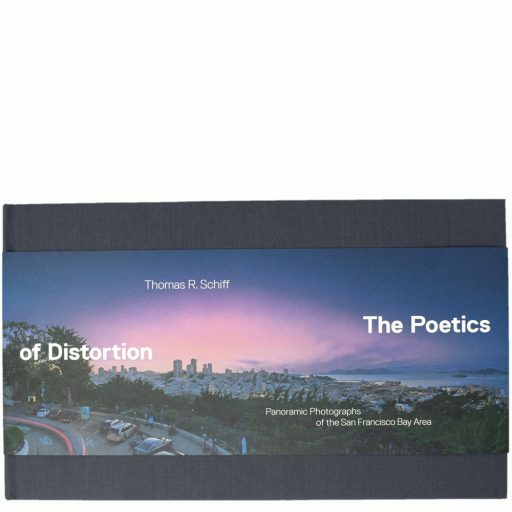 With essays on photography, perception, and architecture by Susan Ehrens, Wendy Lesser, and Tim Culvahouse, and an author interview by Dave Christensen, The Poetics of Distortion: Panoramic Photographs of the San Francisco Bay Area is a mind-bending, eye-opening, very San Francisco journey. Thomas R. Schiff studied photography under Clarence White, Jr. and Arnold Gassan while earning a BBA degree from Ohio University in 1970. Schiff began experimenting with panoramic photography in the mid-1980s, making use of a Hulcherama 360 panoramic camera. He has published eight previous books: Panoramic Cincinnati (2003), Panoramic Ohio (2002), Panoramic Parks (2005), Vegas 360 (2008), Wright Panorama (2010), Prospect (2012), Columbus, Indiana: Midwestern Modernist Mecca, and The Library Book (2017). Schiff helped establish Images Center in Cincinnati in 1980, and he is the founder of FotoFocus, a lens-based art biennial held in Cincinnati.